Authorised retailer for Lorus Watches. Free delivery, 30 day free returns and five-star rated service. Buy now with up to 12 months 0% finance. Lorus are a line of quality watches made by Seiko, the Lorus collection offers exciting designs and exceptional build quality with unbelievable value for money. Lorus watches are built to last with scratch resistant faces, water resistance and screwed-in cases to improve shock resistance. Over the years Lorus have sold over 120 million watches worldwide and the popularity of the brand is growing every single year. The history of Lorus goes back to 1881 when Kintaro Hattori opened the business that would go on to become Seiko. The first wristwatches were released under the Seiko brand in 1924 and the Seiko brand have gained a stellar reputation for quality ever since. Seiko launched the Lorus in 1982 with the aim of becoming the brand of choice for young and young-at-heart consumers. The brand was an instant success thanks to the exceptionally built watches combined with the reliable movements inside the watches provided by Seiko. Lorus watches cover a wide range of styles from sportswatches to beautifully elegant timepieces - whatever the occasion, Lorus will have a watch to suit you. As Seiko are the driving force behind the brand it is no surprise that the watches are incredibly reliable. 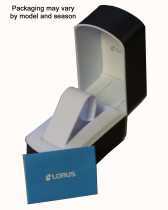 But best of all is the exceptional affordability provided by the Lorus brand, with watches as low in price as £19.99. As you move up the price range you can find impeccably built chronographs under the £100 mark and incredibly stylish, affordable ladies watches. Whether you're shopping on a budget or you just want a quality watch without breaking the bank, Lorus needs to be your go-to brand! Often when you buy a watch in the lower price range you may worry that you'll have to handle it with kid gloves if you want it to last longer than a couple of weeks. Thankfully you won't have this worry with Lorus watches, even the £19.99 watch is water resistant to 100 meters!